I have to laugh when people keep asking me if earthbag building is strong. Earthbags (sand bags) have centuries of use by militaries worldwide, because they’re bomb, blast and bullet resistant. Millions of sand bags are used each year for flood control to stop raging rivers. As well, earthbag building is earthquake and hurricane resistant. Massive earthbag retaining walls like the one in the photo above are now fairly common. The US Department of Transportation uses so many polypropylene sand bags for retaining walls along highways that they did an accelerated aging test to help determine the lifespan. The study showed polypropylene bags protected from sunlight may last over 500 years, and there is no effect from moisture. 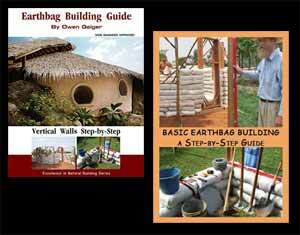 See my Earthbag Building ebook and DVD for details and complete step-by-step building information. Just curious to know if in Canada you would use a footing underneath a retaining wall made of earthbags. The wall is 9 feet high. I don’t think that a footing is generally required under a retaining wall, especially if adequate drainage is established behind it, with weep holes, etc. I think you could use either sand or gravel effectively for such a short retaining wall. Plantings in the area would also help retain the soil. What did they use for UV protection here? Rebar and drain pipes, with additional concrete post and anchors if necessary. The wall will eventually be furnished with vines and other vertical perennials. Will this work? Do any experts out there have any concerns? What kind of bags are they using in this photo? It looks like regular earthbags. They come in lots of different colors, strengths, sizes, etc. Thank you for your continued hard work in promoting EBB and helping the greater community. Question regarding the EB retaining wall. What do you think these bags were covered with to help with protection from the UV rays? Do you have other suggestions from what they have used as well? It’s hard to say because we don’t know what the final retaining wall looks like. These bags are probably industrial spec with high UV rating. Maybe the bags are covered with mesh, more soil and plants? I don’t know. What would be the most cost/durability effective solution for long-term UV protection? Again: These bags are probably industrial spec with high UV rating. Maybe the bags are covered with mesh, more soil and plants? I don’t know. The most affordable solution is to build quickly (within a few weeks), get the roof on and first coat of plaster as soon as possible. Next best would probably be to apply a thin coat of recycled latex paint.